The basic idea was to build a cheap but efficient Kickback High-Voltage Generator to convert 5V up to 450V - 600V in order to reliably feed almost any available Geiger-Mueller tube for maximum flexibility & hackability. This circuit design was inspired by Tom Napier's article in Nuts & Volts, Jan 2004 (republished in issue #184 of Circuit Cellar Nov 2005) which has been used successfully in multiple DIY Geiger-Counter projects worldwide. Since the original circuit incorporated some expensive and hard to get Through-Hole parts (like the STX13005 & UF4007), it was redesigned with modern and available SMT components. This also led to an increased tolerance of the high voltage components up to 1kV instead of 600V. The great thing about this design is the really low BOM count and the fact that it regulates the HV really well WITHOUT the need to have feedback from the HV rail. How does it convert 5V up to 500V and more? The transistor (T1) is turned on and current flows into the inductor (L1). When the transistor is turned off, the input current that formed and maintained the inductor's core magnetic field becomes zero. The magnetic field collapses causing a voltage reversal to occur in the inductor and induces sufficiently high voltage (known as inductive kickback voltage) into the diode (D1). If you want to learn more about it and use a java-enabled browser you can use this inductive kickback simulator. 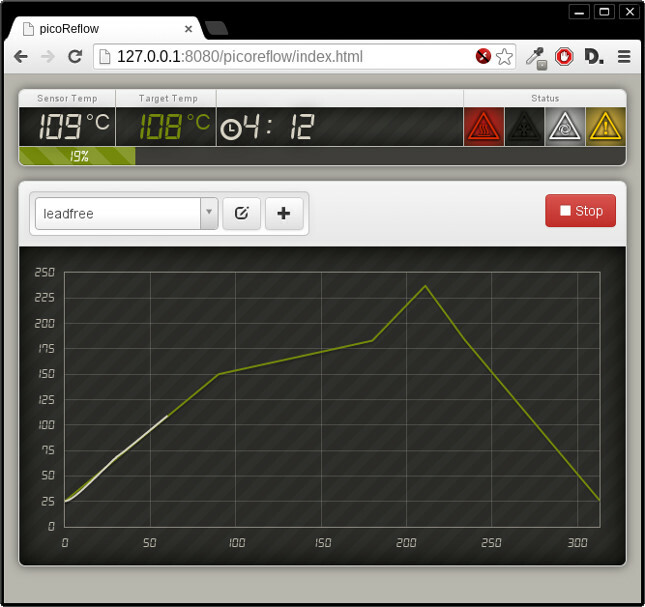 Toggle the switch at the bottom (simulating T1) and watch the voltage graphs to see the effect. A normal 555, which you may find in every EE's box/lab, will not work reliably. It has to be a CMOS 555, tested so far are the TLC555QDRQ1 (Apollo-NG) and ICM7555 (TDRM). The inductor is a high Q wound dust core choke with shielding to minimize EMI. The output voltage is set by the maximum current, which is controlled by the adjustable trimmer (R10) in the emitter lead of the STN0214. A lower resistor value (turning CCW) will result in higher output voltage. Alternatively, when only a certain type of GMT is going to be used with a PiGI module, R10 can be replaced with R10a to set the specific required voltage for the GMT. Please add working values for R10(a) with your particular tube to the Common Table of Geiger-Müller tubes. 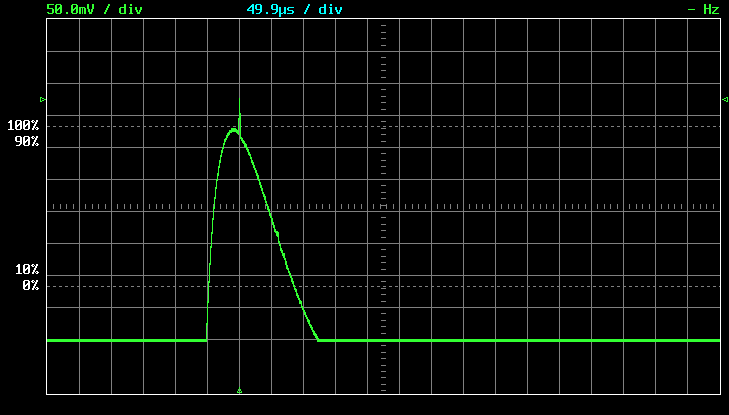 The CMOS 555 oscillates at about 3.2 kHz. Pulse on time is controlled by the inductor and emitter resistor (which sets the maximum current), which in turn sets the high voltage value. Each impulse will pull the selected (J1/J2) GPIO pin to ground via T3 so that it's possible to generate an interrupt which can be counted. This ensures the safety of the PI and also helps to prevent getting false events generated by external EMI. As we can see, it scales very well with numbers and a non-profit oriented production run could bring many modules to people for less than 20 EUR. If a large scale production unit were sold for more than 25 EUR (fully assembled), someone would really be ripping people off. If you're not stacking two modules use either a 0-ohm resistor/solder-bridge on J1 or a capacitor to connect the GPIO Pin of the PI to the inverter's collector. 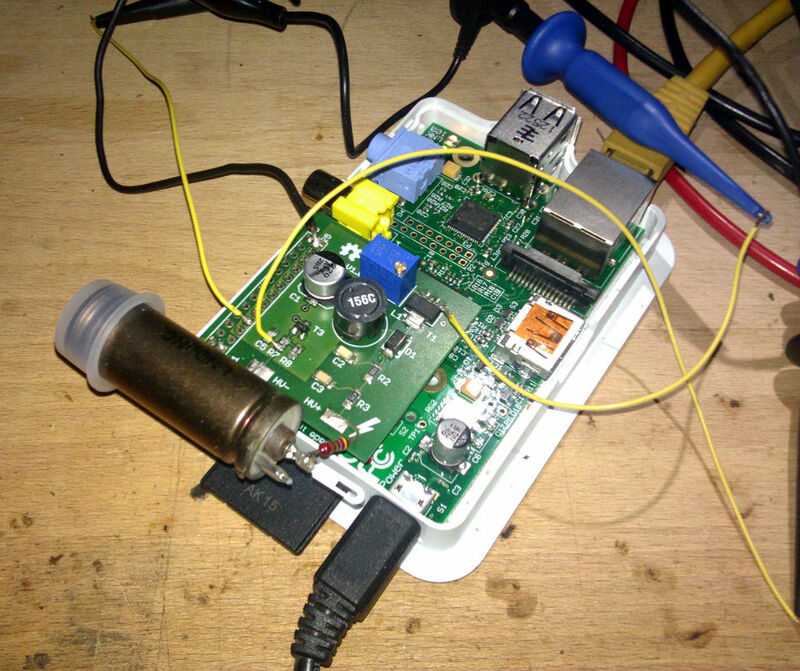 Don't use a capacitor when connecting to a uC with internal pull-up (like a Raspberry Pi). When you want to stack two modules, connect J1 on the lower and J2 on the upper module. The kickback power supply is very efficient (in order to draw less power) and the whole setup is tuned very much to accommodate a geiger-mueller tube as a power consumer. Introducing another consumer (a multimeter with 10 Megaohm for example) draws too much current from the circuit. The supply drops down and we can only see significantly lower voltage values. To mitigate the effect a high value resistor (1 Gigaohm) was used to obtain a somewhat more reliable measurement. The perils, pitfalls and possible solutions to measuring the high-voltage (with some accuracy) and alternative methods to adjust the high-voltage without measurement are described here. It seems, that in practice (industrial/military), cathode connection is always supposed to be used with GM tubes if possible, mainly because it's less likely to affect the characteristics of the tube and reduces undesirable effects. The extra capacitance of the output circuitry added to the cathode is considerably less significant than when added to the relatively small anode. This was taken into consideration while designing the PiGI. For optimal tube operation R3 (anode resistor) and the equivalent of R7/R8 (cathode resistor) should have a 45:1 Ratio, at least that seems to have become “industry standard”. A short test with the LND712 GMT showed that indeed the signal flanks became a bit more precise when R8 is 220k instead of 100k in order to match the 10M for LND 712. However, in many other tests the circuit has shown a very high resilience against “suboptimal” operating conditions. 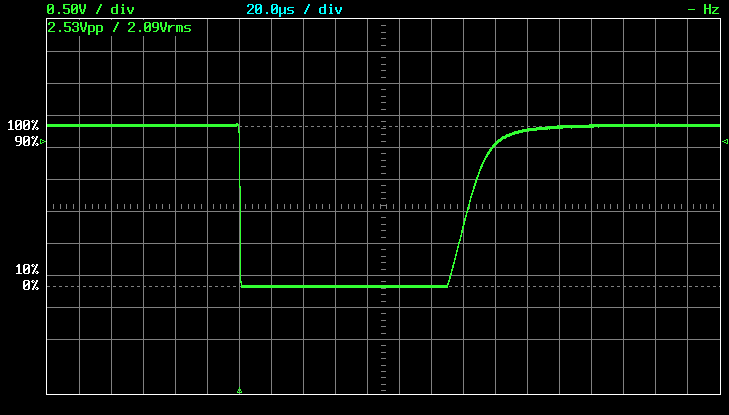 This is how the final impulse signal looks like to the counting IO Pin. It also leaves a question: For the LND 712 the dead-time is supposed to be 90us, but when you count the divs in the scopeshot above it is about 140us. Shouldn't in this case 140us be used as a base value for the dead-time algorithm? Since everything is over-regulated these days, up to the point where only multi-national-corporations can obtain the resources needed to develop something easily, it's quite a challenge to find radioactive test sources to probe a Geiger Counter with more than just the local dose rate. So instead of having simple access to quality test-radiators which can be handled and stored in a safe manner, we have to improvise and hack something out of whatever we can find. When we consider that the regulation's original intent was protecting people from harm, it backfired pretty well in the real world. Well, for the sake of accuracy, I was talking about the tolerance of the components specified by the manufacturer and not the resulting output voltage :) So I gather you've already tested the STN0214 in your setup? Well there's accuracy and reality . Since the duty cycle is so short the HV transistor can go well above it's ratings. A moot point though. It would have been nice if you would have added a link to our site instead of just doing a grab and run, to give people the whole picture where you got that information. After all you weren't stingy to throw links to your site at every opportunity here (aside from the links provided in the wiki already), no? In the picture under the Signals section I see a resistor right on the anode. Is that an anode resistor I have to add (depending on the tube type) or was that some temporary fix? You mean the red one connecting the anode of the tube with the PiGI board? Indeed that is an additional anode resistor. R3 is the on-board resistor equipped with 4.7M. Some tubes need more and since some solder connection was needed to get the anode of the tube connected to the pad of the board, I used another 4.7M resistor to come closer to 10M and have my tube connected at the same time. If you need more anode resistance, you could do it just like that or replace R3 with a higher value and use a plain wire to connect the tube. Keep in mind though, supposedly, the anode resistor should be as close to the anode as possible (so I've heard). I see. The 4.7M should be fine for my STS-5 tube, although adding another few hundred k couldn't hurt either. I have a question though. I have an assembled board now, but with a PZTA44 transistor (400V) rather than the STN0214. 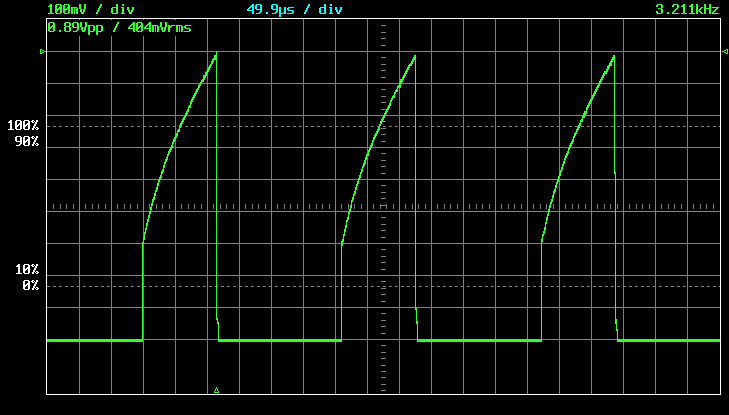 That could be OK at low voltages (or…? ), but the problem is when I adjust the trim pot, the voltage goes from 0 to 420V (measured with a 10M multimeter between HV- and HV+, so it's probably 800V+ in reality) in one step; there are no intermediate voltages. 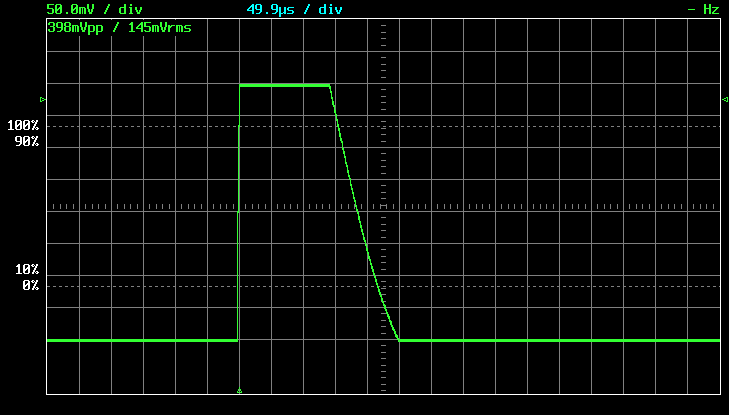 Knowing most GM tubes' operating voltage is lower, I guess this is not normal. Any ideas? Maybe you can try to re-measure with these points to get a result closer to the original reference measurements above. In the first tests the voltage was set way too high and the voltage was actually at 5V. After turning the poti down the whole way and coming back up slowly showed the voltage build-up. If you have good ears you can hear a feep sound (with the STN0214, others may vary) which increases with the voltage level. As a basic rule, when we could hear it we weren't far off. Having a test radiator in front of the tube while bringing the voltage up and using something to count the ticks also helps finding the best plateau voltage of the tube. Yes, but why measure there? This is something I don't understand. What matters ultimately is the voltage the GM tube sees. That will decide if the tube will work at all or you will fry it. Hi, where did you order the PCBs for 7,23€ per board? I only find services with prices about 12€ per board (10 boards order). Or do you have a PCB for me? If not I will order 10x PCB and 10x parts from mouser (~12€ per package). IIRC, the original prototype boards were ordered on http://www.multi-circuit-boards.eu. It's already been some time ago, so prices may have changed. Have you tried http://pcbshopper.com/ to get a wider range of quotes? Unfortunately there are no more spare PCBs from the first batch left, otherwise I would have send you one. There is still plenty of traffic by people looking for PiGIs so if you do a new batch, I'm pretty sure there will be more people who would like to chip in and share the costs, to get one as well. Nice astronomy page you got there, love the C/2014 Q2 Lovejoy pic, especially considering that it was done in a light polluted area. Thanks! Unfortunally http://www.multi-circuit-boards.eu/ is only for corporate clients. http://pcbshopper.com/ gives me some cheap manufactures in China but I didn't create or order any PCBs yet. So I have no idea what's the important options. I opened the PiGI Layout in eagle and clicked on the PCB service button. There I got an pre filled form on http://be.eurocircuits.com that looks ok. An order of 20 pieces would cost about 135€ (~6,75€ per board) and would be affordable for me. I can resell them for the same price (6,75€ + shipping cost from Germany). If more people are interested I can also order a bigger contingent. Thanks! C/2014 Q2 Lovejoy was just a “fast shot” before the clouds arrived :) I was surprised that I could see the comet with my naked eyes from Dresden. Pah, don't let yourself be discouraged by that :) Hackers in a hackerspace/hackbase are in no way corporate clients and yet there is a lot of development and low/medium scale fabbing going on. As long as they get their money, most of them don't even ask. I guess in most cases it's just to avoid some stupid law forcing them to have to comply to certain ways of pricing and taxing services and products, if they officially cater to “enduser-consumers”. Chinese suppliers are also a great option, it has become incredibly easy these days to order stuff directly in Asia and (with the usual few exceptions) the quality is also quite good. You can look in electronic boards or search for reviews and pictures of PCBs produced by a certain manufacturer that comes up in your quoting evaluation to get a better feeling for their products. So I got a package of 20 PCBs for ~4,70€ each at eurocircuits :) I soldered the first PCB but C5 is missing in the mouser list. It seems to work without C5, an Arduino Nano and an FHZ76V but I have no real radioactive material here to test the rate. I will buy the C5 capacitor at Conrad the next days. Awesome, thanks for sharing and the time and effort to do it. 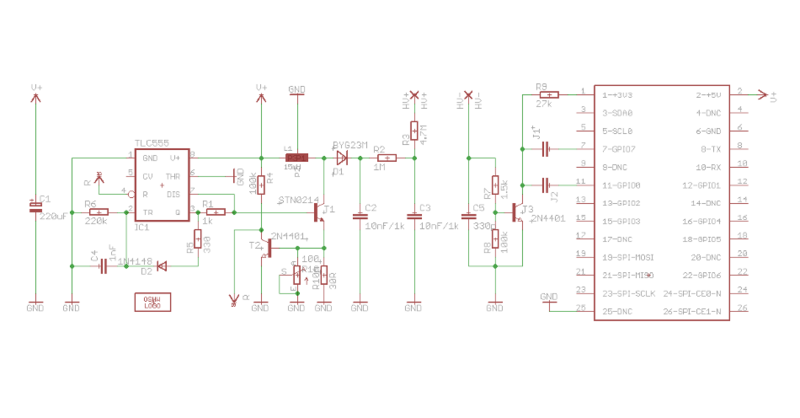 As for C5, it's no absolutely vital component, I guess the circuit should work just as well - but I've never simulated or tested the board without it. Is it not in the BOM at all anymore or were none available at mouser? Because the BOM used to be complete at the time… hmm, need to check. Hey you made the PCB layout, I just ordered it :) C5 isn't on the BOM. I ordered this capacitor at Conrad (I don't have to pay shipping costs because we have a store in our city) https://www.conrad.de/de/keramik-kondensator-0805-330-pf-50-v-5-l-x-b-x-h-2-x-125-x-06-mm-wuerth-elektronik-wcap-csgp-885012007060-1-st-1279321.html I hope it's the right one?! 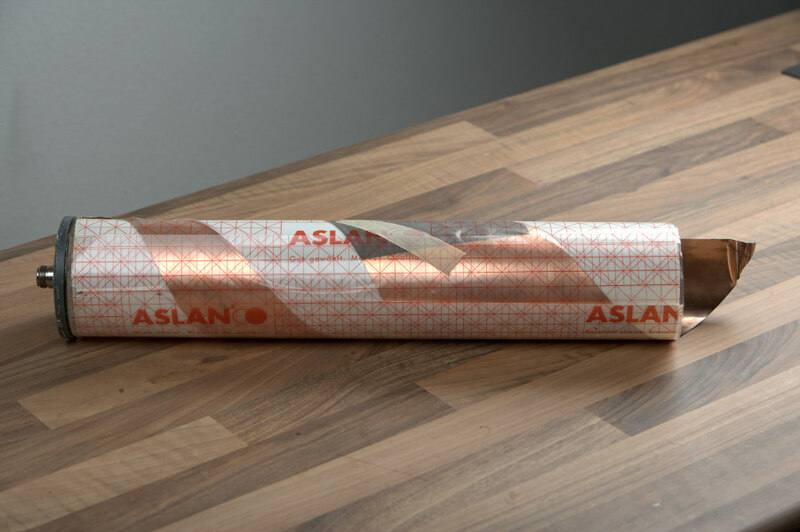 Hallo, Have got some basic questions: Are there one PCB left? Where do I buy the actual GM Count Tube? How much is it? How accurate is everything? Is the bill list still on the latest revision? I got some more requests in the last days. At the moment there are 5 boards left but 2-3 of them are reserved. So I can offer you a board for 4,70€ (PCB) + 12€ (parts from mouser list, already soldered) + shipping (0,90€-5€ from Germany). At the moment I'm waiting for parts for the last 5 boards because some parts weren't available. Just send me a mail to info[at]millionen-von-sonnen.de I attached a SBM-20 tube to my PiGI. It's about 15-20€ on eBay: http://www.ebay.de/itm/281030695096 I tested with a gas mantle (thorium nitrate) and some uranium glass. @Fehlfarbe: If it's getting too much and you'd like to get your email-address removed from the comments and replaced by a new mailing-list just give me a ping. I don't have the time right now to do the search for you, but I'd recommend to spend a little time figuring out what you want to achieve in terms of detection, i.e. gamma only, beta + gamma or alpha + beta + gamma. Once you know what you want you can start to search for specific tubes (and their common names/ids) to get good search results and offers from Germany/EU. Prices vary very much depending on those parameters, can go from 10 EUR like the SBM-20 above or up to 100 EUR when you want a brand new abg capable LND712. Again, this came up before, accuracy is tricky in terms of ionizing radiation metrics without very expensive gamma spectroscopy gear, which can not only tell us how much radiation there is but also what kind of source (isotope) it is. A GM tube can only accurately count ionizing events triggered by radiation passing the tube. By using masks/windows we can also determine if we're dealing with alpha, beta or gamma radiation (depending on the tube's capabilities). These are our base metrics. From here on, everything is done via math and magic numbers for each tube, to end up with so called equivalence values like uSv/h. This equivalent dose rate represents a certain radiator like cobalt-60 or Cs-137 and is based on the surface/volume ratio of the human body model, to give us more meaningful data. Having said that, it's not important to be accurate. As long as the detection behavior doesn't change over time (which it didn't so far) we have a very good instrument to record, share and compare our collected baseline data while no event has happened. Whatever the absolute numbers are in terms of uSv/h, we'll most definitely see an increase in case of an event and the counts per minute values will always be a solid, reliable and comparable base-metric. Do you happen to remember when/where you saw it on TV? Ah, funny. Thanks for the update. Here in Germany you can buy >130000 CPM (that's >800µSv/h if that'd be calibrated for Cs-137) (measured on a SBM-20) pitchblende for 50€, 1000 µSv/h for 60€-65€ and 1200-1500 µSv/h for 70-80€. Perfectly legal to buy. There are known Ebay sellers, and if you want these rather active stones, send them a private message, because they might not put them on Ebay directly, not that it would be illegal to do so anyway AFAIK, but they are not as cheap. Pretty sure you will get one. I don't see the PCB included there..wonder what else is missing..
Well, of course you won't get a custom made PCB from Mouser, since they are a component distributor and not a PCB fab house. Please ask Fehlfarbe as mentioned above or build your own. Also, it seems C5 has been dropped out of the original Mouser BOM link, so keep in mind to add a 0805 330pF/50V yourself. We've seen the pitchblende offerings on ebay but most of them were either to expensive or would have created too much effort to make a sensible/secure storage casing for the minerals. “Well, of course you won't get a custom made PCB from Mouser” I thought there was a way for a small private individual to put its own PCBs there, but I guess I should have known better. What don't you create a new link, otherwise people are going to order from this link and miss parts. As for the pitchblendes: Well you pay only once in your lifetime like 65€ and get constant 160kCPM ~ 1mSv/h for that time. That may be worth it if you want to design a PCB and test how stable it performs (design a stable one for those CPM flux values can be a problem). Such hot stones (or even hotter than that: there are 400kCPM ones for several 100€) are more rare and so have of course their price. But I give you that the shielding/storage is indeed a problem. PS: are you still planing a crowdfunding? Well, we're not spoon feeding here :) It's our own freedom and therefore our responsibility to re-check data we use/get, in this case with the BOM on this page. Anyhow, C5 has been re-added to the mouser BOM. Part availability is a constantantly moving target, I don't get why mouser would drop a single item of the BOM, but hey, database maintenance is gonna maintain, or not. Since there has been a surge of new interest, due to the situation in east belgium/western germany and the great work of the FiFF folks of deploying an independent p2p radiation sensing network based on PiGI we may give it a try to restart the crowdfunding campaign. Since basically all relevant public media outlets refused to publish anything about PiGI back in 2013, we didn't get the required critical mass to reach enough people who'd consider to back the project. Maybe this time? Update: I sold the last PCB and assembled PiGIs some days ago. Maybe I will order a new load PCBs in march or april when I have more money. Just a quick note from me: You can order a set of 3 pcbs for $13.00 from oshpark (free shipping), that's 4,34$ each or 4,09€. Currently (? ), there is free shipping for most orders over 50€ at mouser, so when I found some additional parts I need besides the ones for 3x this project to get this sum, I will order. Hey Dani, I already ordered 100x PCBs and 100x 100Ohm 3296W Trimmer (the most expensive part of mouser BOM list) from China. 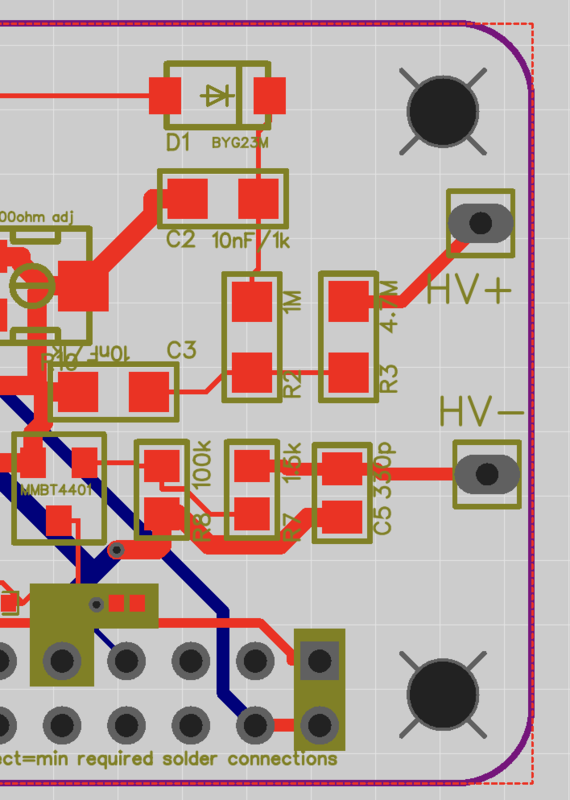 Maybe I can offer PCB+Trimmer for about 1,60€ in a few days. The packet is checked at the customs at the moment. So I got a new load of PCBs and trimmers: https://imgur.com/T5mQHdy Price is now 1,70€ for PCB+trimmer (so you don't have to buy the 3299W-1-101LF trimmer for 3,20€ from mouser BOM list). 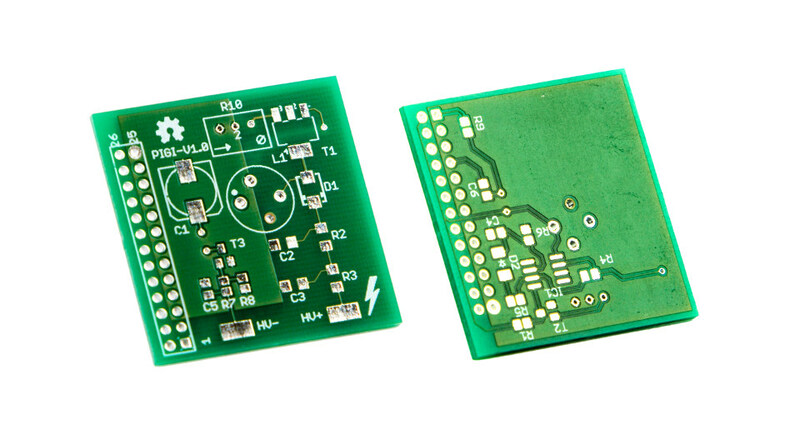 If you don't need the trimmer you can buy the PCB for 1,50€. Has anyone wired one of these upto a zero, pi2 or 3? I have an extra pi2 and zero but was hoping wire it to the zero or the new zero w. I assume I can just based on the pins but wanted to see if any one had done it first. PiGI should work with all Raspberry Pi models. Also with Arduino and other microcontrollers that have an 5V, 3.3V and digital input pin. I bought 2 of these boards from you(quite a while ago lol) and finally getting around to setting this up and I was wondering do you Fehlfarbe or anyone else know off hand what temp I should set my iron on when I'm building this? It's not really so much to worry about. If in doubt, take some old piece of PCB or some 2.54 breadboard and try different settings with your particular solder type to get a feeling for it. I'm using solder with lead (Stannol S-Sn60Pb39Cu1, 1mm diameter) so my temperature is about 350°C. So just try some temperatures between 300-400°C. IIRC the solder will “stick” on the iron if it's too hot. I'll put together a USA-based kit- board plus parts, or already-SMDed board plus PTH parts, if there's enough interest. Revising/sourcing this. Why are three pins of the Murata inductor used? Per the datasheet, only two (pins 1,3) are connected. That means the tie to V+ isn't doing anything. Am I wrong? two pins for the coil, one pin to gnd for the shield. Here's my remake so far. I changed to the Pi Zero hat style, moved all the components to the top side and used SMD where possible, also added a pinout for a common esp32 header row so this can be used in either application. I need to revise the BOM a little more. I'd love to simplify the part count but I think I'm better off making sure it works first. Did an autorouter produce this layout? I'm not sure if I'd be happy when my HV line would be routed all over the place like that. This is still a SMPS in essence, so care should be taken to place switch, inductor, diode and capacitor close together. 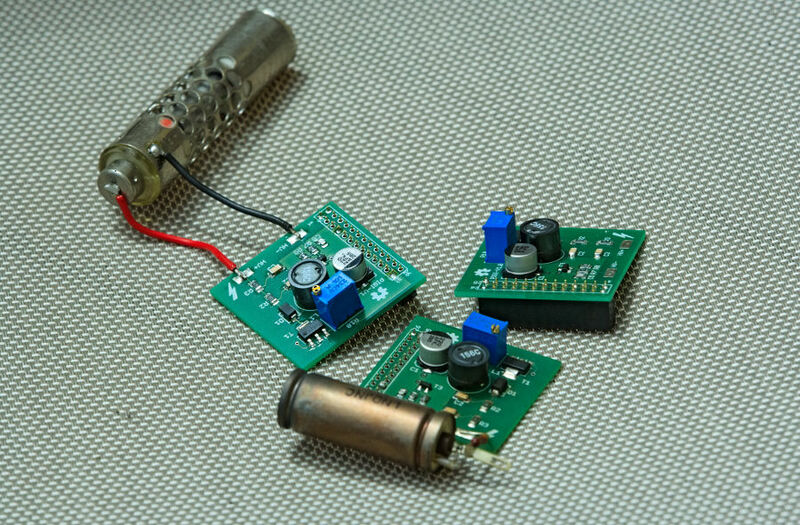 If you wanna go top components only, you may get away with grouping signal generator on the left side and HV generator (switch, inductor, diode, capacitor) and event detector on the right. Try to keep HV on one side and without vias. I'll probably still do more, but I'm trying to put HV closer to the HV stuff. 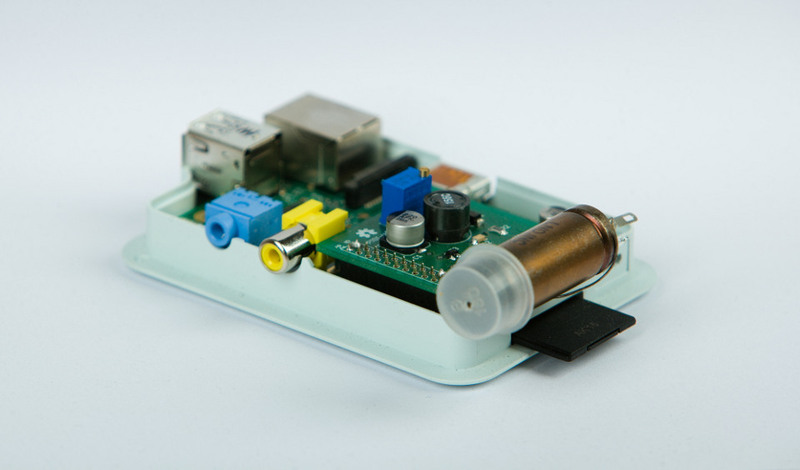 Hi, what's the best and cheapest way to get the parts to build one of these for a Pi Zero, in Ireland please? For the past few years I have been at work designing a functional Pip-Boy 3000 Mk IV, replica prop, from the video game Fallout 4. Having a working geiger counter has been high on the list of features. I was happy when I came across your compact, yet adjustable design. I am now working to implement it into my project. My needs will not be for any accurate monitoring and logging, just a sound and moving a gauge upon each hit. My question is why does it use two GPIO pins connected to the same signal? You can connect the signal by bridging J1 or J2 to one of the GPIOs. There are two possible GPIO pins so you can stack two PiGIs (one for α and one for β/γ radiation) and connect them to different pins. Made a few boards. 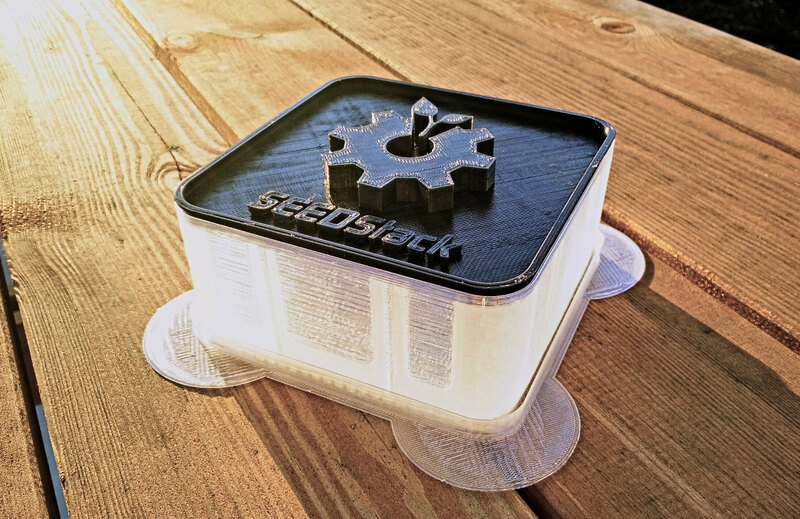 Are available already build or PCB + components. Anyone interested? thanks for answering! The ones on ebay doesn't yet seem to be the Pi-Zero-HAT-format? Hmm, I would have expected a pi zero to be at least equally capable as a platform. When you say “using the GUI”, do you mean running just an instance of pygi server on the pi zero and connecting with a laptop/mobile to it or do you mean running a fully fledged X server with a browser on the pi zero as well to act as client/server in one package? the initial idea was to have the new PCB on a Pi Zero an make it a Server putting the data to a backend-box with webservice and statistics. The counter itself should have been as small as possible. But after some research I think I'm going to choose a SI-22G tube (What do you think?) which itself is not small. So I could buy a original sized kit at ebay. OK. Soldering…. Thanks Rene for your kind support! It seems the link to mouser.com (in the section BOM on this site) is broken. One should replace “mouser.com” by “www.mouser.de”. Mmmhh, mouser.com is back again. Sorry for th noise. since I'm using an Arduino instead of Raspberry is it possible to use lower voltage supply for the board of arround 3.7 to 4.2 V from Li-Ion / Li-Po Battery instead of 5V?